37 C.F.R. 3.28 Requests for recording. Each document submitted to the Office for recording must include a single cover sheet (as specified in § 3.31 ) referring either to those patent applications and patents, or to those trademark applications and registrations, against which the document is to be recorded. If a document to be recorded includes interests in, or transactions involving, both patents and trademarks, then separate patent and trademark cover sheets, each accompanied by a copy of the document to be recorded, must be submitted. If a document to be recorded is not accompanied by a completed cover sheet, the document and the incomplete cover sheet will be returned pursuant to § 3.51 for proper completion, in which case the document and a completed cover sheet should be resubmitted. 37 C.F.R. 3.31 Cover sheet content. (ii) Sign the cover sheet using some other form of electronic signature specified by the Director. (8) For trademark assignments, the entity and citizenship of the party receiving the interest. In addition, if the party receiving the interest is a domestic partnership or domestic joint venture, the cover sheet must set forth the names, legal entities, and national citizenship (or the state or country of organization) of all general partners or active members that compose the partnership or joint venture. (b) A cover sheet should not refer to both patents and trademarks, since any information, including information about pending patent applications, submitted with a request for recordation of a document against a trademark application or trademark registration will become public record upon recordation. (2) Indicate, if applicable, that the document to be recorded is not a document affecting title (see § 3.41(b)). (d) Each trademark cover sheet required by § 3.28 seeking to record a document against a trademark application or registration should include, in addition to the serial number or registration number of the trademark, identification of the trademark or a description of the trademark, against which the Office is to record the document. (e) Each patent or trademark cover sheet required by § 3.28 should contain the number of applications, patents or registrations identified in the cover sheet and the total fee. (f) Each trademark cover sheet should include the citizenship of the party conveying the interest. (4) Indicate the date the joint research agreement was executed. (h) The assignment cover sheet required by § 3.28 for a patent application or patent will be satisfied by the Patent Law Treaty Model International Request for Recordation of Change in Applicant or Owner Form, Patent Law Treaty Model International Request for Recordation of a License/ Cancellation of the Recordation of a License Form, Patent Law Treaty Model Certificate of Transfer Form or Patent Law Treaty Model International Request for Recordation of a Security Interest/ Cancellation of the Recordation of a Security Interest Form, as applicable, except where the assignment is also an oath or declaration under § 1.63 of this chapter. An assignment cover sheet required by § 3.28 must contain a conspicuous indication of an intent to utilize the assignment as an oath or declaration under § 1.63 of this chapter. (G) The signature of the party submitting the document. 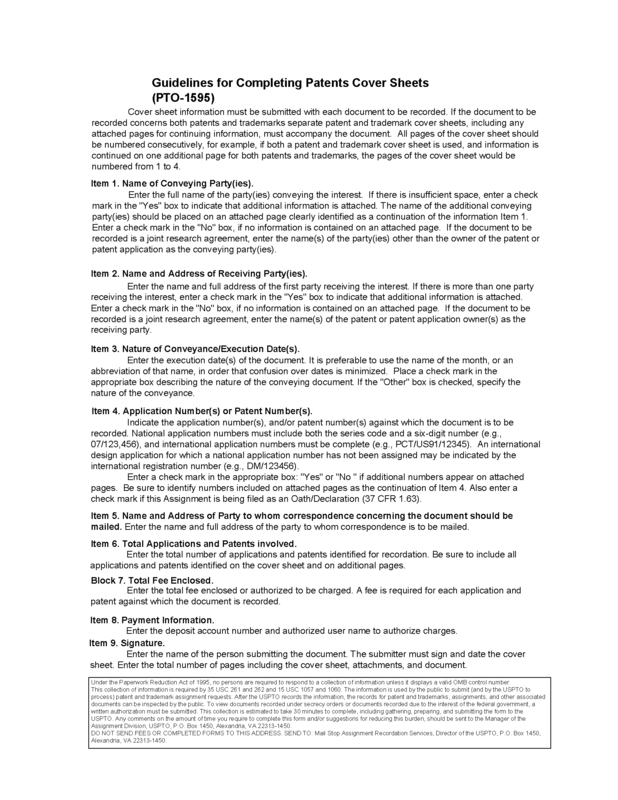 For applications filed on or after September 16, 2012, if the assignment document is also intended to serve as the required oath or declaration, the cover sheet must also contain a conspicuous indication of an intent to utilize the assignment as the required oath or declaration under 37 CFR 1.63. See 37 CFR 3.31(h). 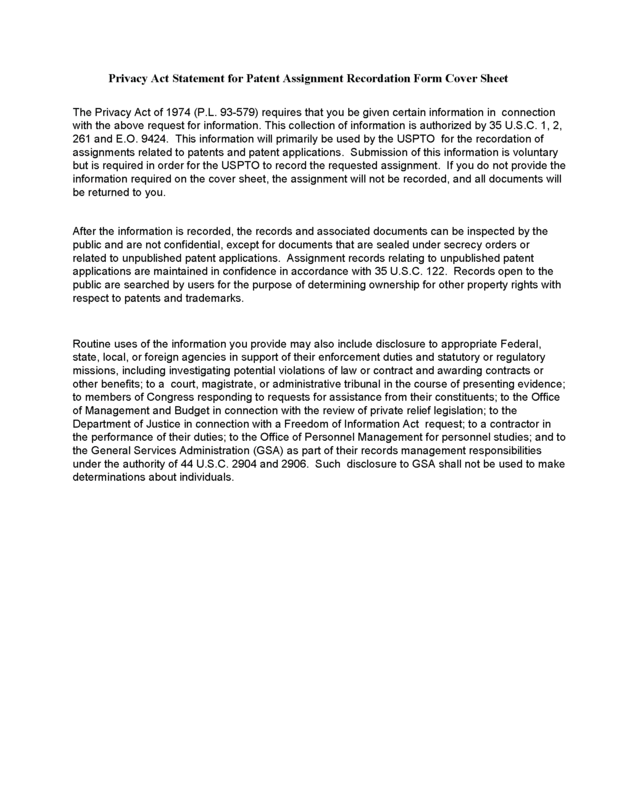 If the document submitted for recordation is a joint research agreement or an excerpt of a joint research agreement, the cover sheet must clearly identify the document as a "joint research agreement" (in the space provided for the description of the interest conveyed if using Form PTO-1595). The date the joint research agreement was executed must also be identified. The cover sheet must also identify the name(s) of the owner(s) of the application or patent (in the space provided for the name and address of the party receiving the interest if using Form PTO-1595). The name(s) of every other party(ies) to the joint research agreement must also be identified (in the space provided for the name of the party conveying the interest if using Form PTO-1595). Each patent cover sheet should contain the number of patent applications or patents identified in the cover sheet and the total fee. Cover sheets required by 37 CFR 3.28 seeking to record a governmental interest must also (1) indicate that the document relates to a governmental interest and (2) indicate, if applicable, that the document to be recorded is not a document affecting title. A patent cover sheet may not refer to trademark applications or registrations. 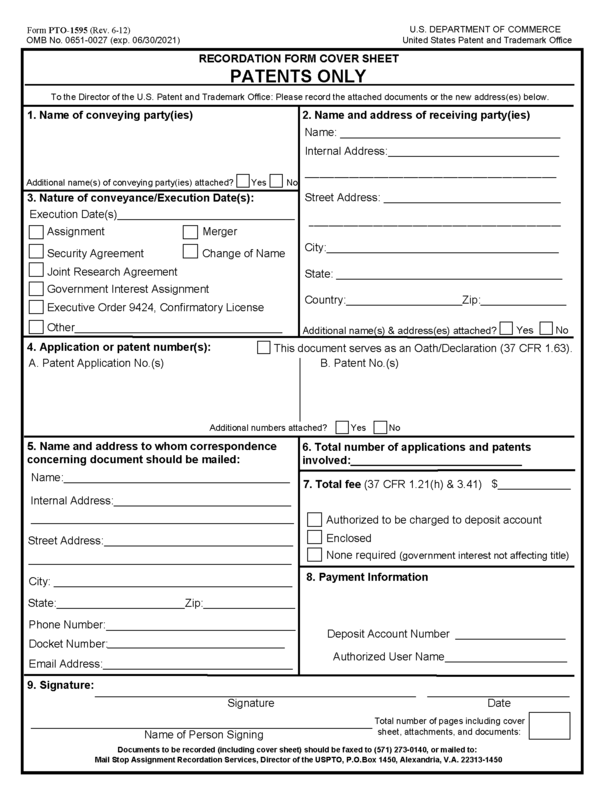 Form PTO-1595, Recordation Form Cover Sheet, may be used as the cover sheet for recording documents relating to patent(s) and/or patent application(s) in the Office.